Dice are objects used in games when something random needs to be done, such as moving a piece a random number of places on a board. Most dice are cubes that have the numbers 1, 2, 3, 4, 5 and 6 on the faces. 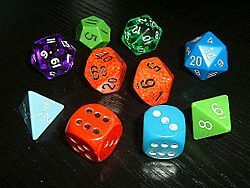 Dice are sometimes made in other shapes than cubes, but the six-sided die (die is the singular of "dice") is the most common. A die is usually rolled by the player’s hand. When calculating together opposite sides of typical dice, result is always 7. Some games are played with two dice and some use only one. Some games that use dice are Monopoly, Yahtzee, Risk, Dungeons and Dragons, and many more. Dice with different numbers of sides are called polyhedral dice. Weights can be put inside a die to make it only land on a certain number once it is rolled. Composite image of all sides of a 12mm Roman die, found in Leicestershire, England. Dice Facts for Kids. Kiddle Encyclopedia.